This week’s adventures took me to Atlanta for a couple of days. I didn’t get everything done that I had planned on, but it was still a wonderful time. 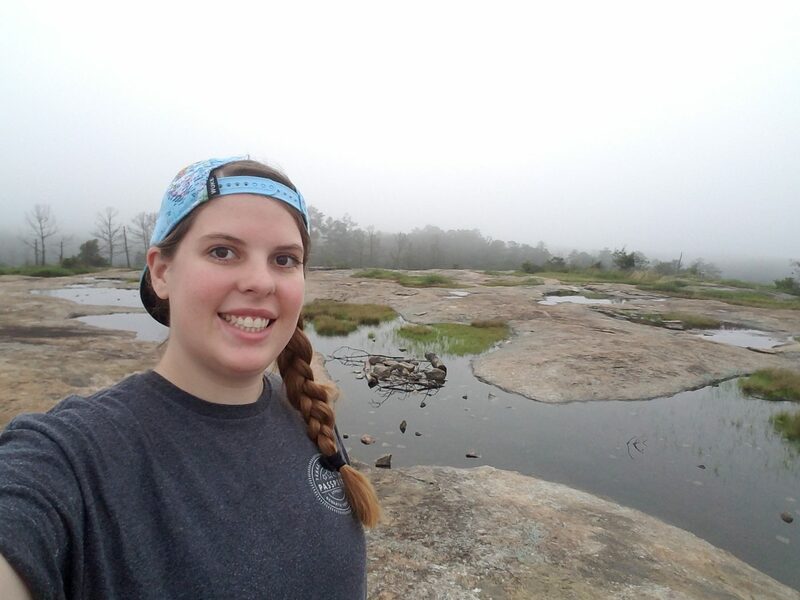 I started my first morning of exploring at the Arabia Mountain Nature Preserve. The area used to be the largest granite quarry in the world before being donated to the county and set aside as a nature area. It’s so close to Atlanta, but it doesn’t feel like it at all. I did 2 hikes at the preserve: the first up the mountain, and the second a trail through a forest area to a lake. It was a bit of a foggy morning, but both hikes were a lovely way to start the day. After Arabia Mountain, I went to the Tellus Science Museum. Tellus is a medium sized museum with 4 exhibit areas. The first exhibit focuses on geology and everything from meteorites to gemstones to the layers of the earths crust. There was also a really cool periodic table display that had examples of each element displayed on the table. The second exhibit was dinosaurs and fossils. The layout really let each era have a star that wasn’t overpowered by any other displays. The third exhibit hall focused on transportation from bicycles to space ships. The cars and bikes were all displayed on mirrors which was really neat. The last exhibit hall had science examples from the backyard and featured a lot of really cool activities and showcased the science we encounter everyday. I really enjoyed my trip to the museum, and I liked the depth they were able to display within just 4 exhibits. My third stop of the day was at the Fernbank Science Center, not to be confused with the Fernbank Museum of Natural History. While I think I would have enjoyed the Natural History Museum more, it is not an ASTC site, and the reviews were not high enough for me to want to pay to go. The Science Center is a very small museum/school. There were classrooms off the exhibit hall and a school across the street that was associated with the center. There wasn’t very much to see in the museum. There were some live reptiles, a few small dioramas, and the Apollo 6 module. It was free even without reciprocal benefits, but it mostly seemed like a supplement to the school as opposed to a museum of its own. After Fernbank, I went to the Martin Luther King Jr. Historic Site which may have been my favorite stop of the day. The site includes the King house, the King Center museum, the reflecting pool and burial place of Dr. King, his church, and a visitor’s center with exhibits. I started out walking through the neighborhood because of where I had parked, and it was neat to get to see the homes on the block. I didn’t do a house tour because they were sold out, but house tours are hit or miss anyway, so I wasn’t too disappointed. I then went to the King Center which had exhibits on the Kings, Gandhi, and Rosa Parks. The King room had a lot of MLK’s belongings as well as some of Coretta’s belongings. It was very surreal to see and really think about how new so many of the items looked and how recent the Civil Rights Movement really was. The reflecting pool and burial place are just outside the Center, and they whole design of the outdoor space and quotes was really beautiful. Touring the church, it was so interesting to see how much it looked like any other church, and to think about how many important discussions happened was very powerful. I finished my trip at the visitor’s center. A lot of the exhibits were very text heavy, but the wagon that Dr. King’s coffin was transported in was really powerful to see. I also really enjoyed the hopeful nature of some of the exhibits about today’s struggles in the museum. Overall, it was a really powerful and beautiful memorial area, and I’m really glad that I went. My second day in Atlanta, I ended up relaxing in the hotel for the morning instead of going out exploring. It was nice getting to have a more relaxed day even if I didn’t end up getting to see everything because of it. I did go to the Olympic Park in the afternoon for a little while, which was a really cool area. I really enjoy the intentional green spaces in cities, and Olympic Park was no exception. I also went to a show at the Village Theatre and see some friends which was nice. Overall, this week was a little less packed than some weeks, but I still enjoyed the adventures I went on. While I really love exploring and getting everything in, sometimes it’s nice to just relax for a day. I can’t believe it’s already July. I have so many more things I want to explore while I’m here, and I hope I will have enough time to get them all done.